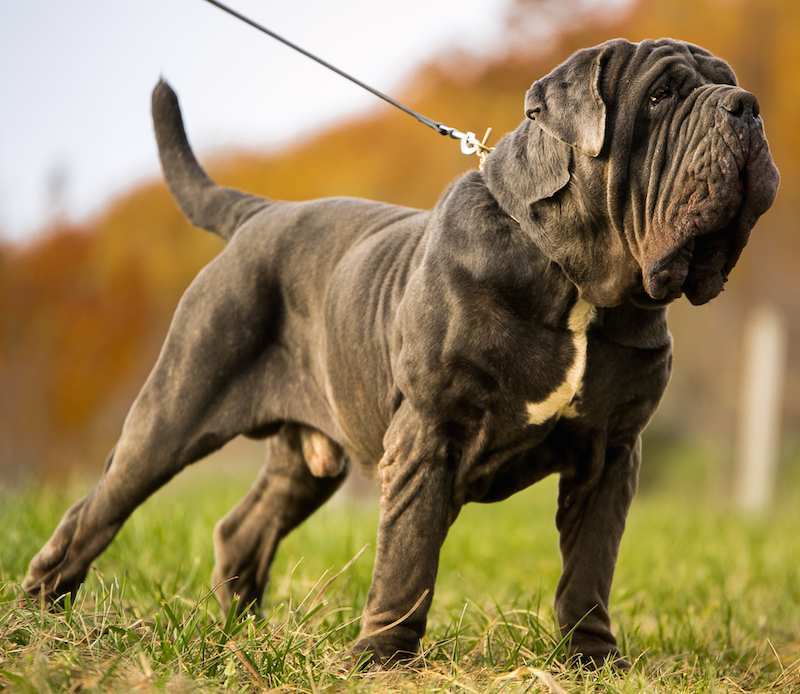 Neapolitan Mastiff is a descendant of the great Roman mastiff described by Columelle in the first century A.D. In his book “de re rustica”. 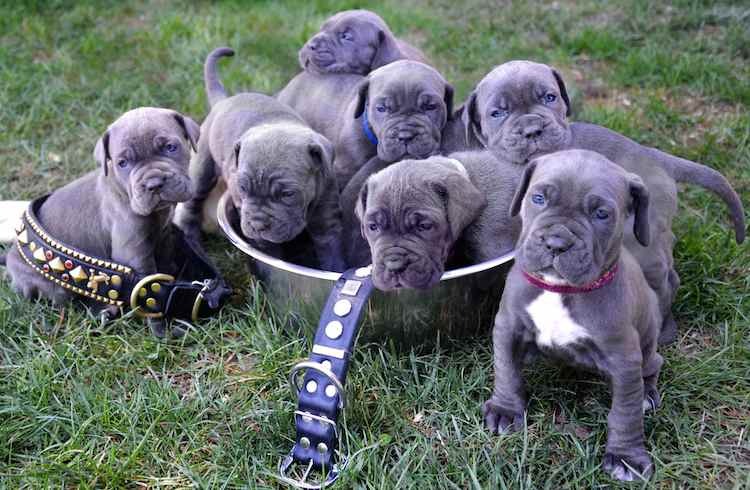 This breed fought with the Roman legions and was spread throughout the empire during the Roman invasions. He is the ancestor of many mastiff breeds in other European countries. Having survived so for many centuries in the countryside at the foot of Mt. Vesuvius and in the region of Naples, he has been selectively bred since 1947. 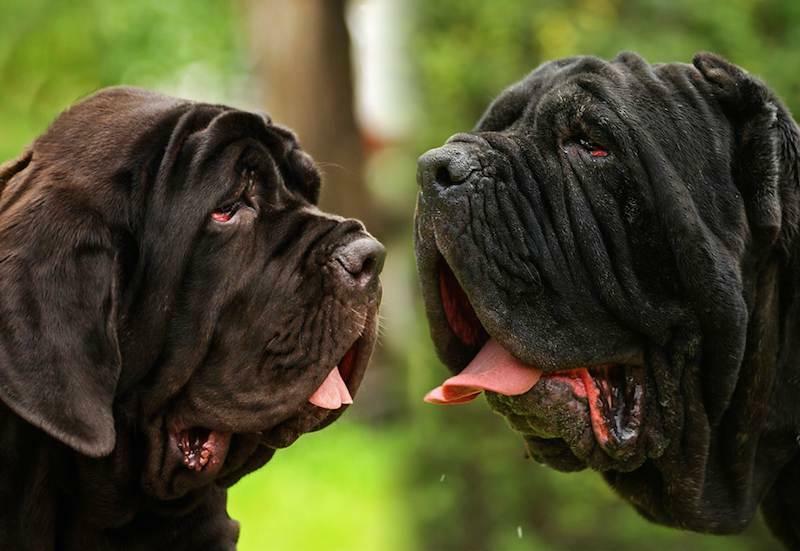 Neapolitan Mastiff Temperament: Steady and loyal, not aggressive or biting without reason, guardian of the property and its inhabitants, always vigilant, intelligent, noble and majestic. 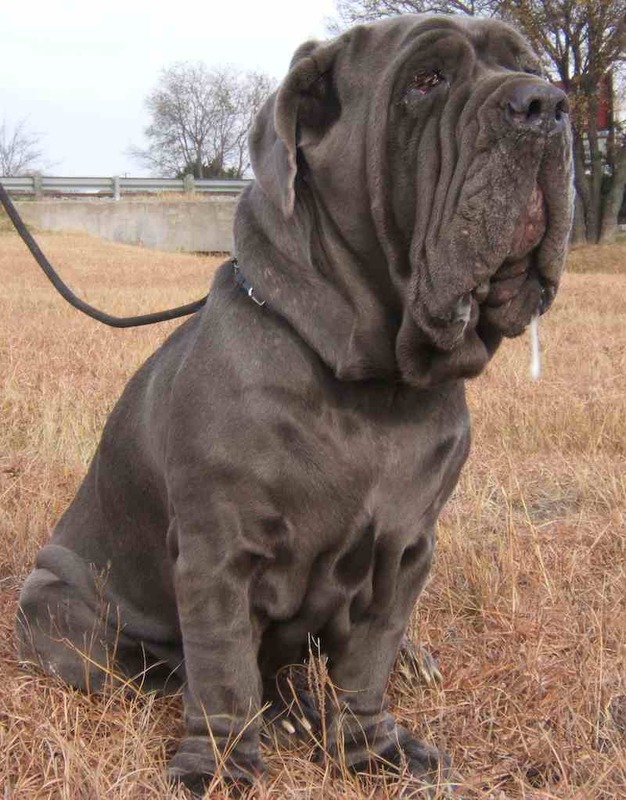 Under normal circumstances, the Neapolitan Mastiff is generally docile and unaggressive. However, he is known as an exceptional guard dog and may be vigorous in defence of home and family. He is steady and loyal with those he loves. Neo Males 25 to 29 inches (65 – 75 cm). Neo Females 24 to 28 inches (60 – 68 cm). Some tolerance of < inch (2 cm) more or less is allowed. Coat & Colour: Skin: thick, abundant and loose all over the body, particularly on the head where it forms numerous folds and wrinkles, and at the lower part of the neck where it forms a double dewlap. Coat: Short, rough and hard, dense, of the same length all over, uniformly smooth, fine and measures 1.5 cm maximum. Must not show any trace of fringing. 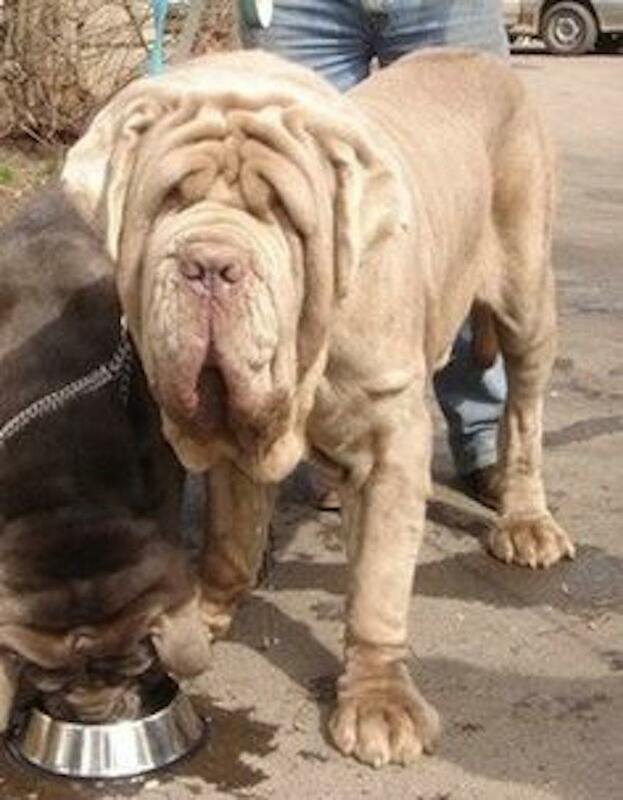 Colour:Neapolitan Mastiff preferred colours are: grey, leaden grey and black, but also brown, fawn and deep fawn (red deer), with, sometimes, little white patches on the chest and on the tip of the toes. All these coats may be brindled; hazel, dove-grey and Isabella shades are tolerated. Head: Short and massive, with a skull wide at level of zygomatic arches; its length is about 3/10 of the height at the withers. Ample skin with wrinkles and folds of which the most typical and the best marked goes from the outer palpebral angle down to the lip angle. The upper longitudinal axes of the skull and the muzzle are parallel. Skull: wide, flat, particularly between the ears, and, seen from the front, slightly convex in its fore part. The bizygomatic width is more than half the length of the head. The zygomatic arches are very prominent, but with flat muscles. The protuberances of the frontal bones are well developed; the frontal furrow is marked; the occipital crest is hardly visible. Stop: well defined. Nose: set in the prologation of the muzzle, must not protrude beyond the outer vertical line of the lips; must be voluminous with large, well opened nostrils. Its colour is according to the colour of the coat: black for the black subjects, dark grey brown in dogs of other colours, and chestnut for brown coats. Muzzle: it is very wide and deep; its length corresponds to that of the fore-face and must be equal to the third of the length of the head. The lateral sides are parallel (between them), so that, seen from the front, the shape of the muzzle is practically square. Lips: fleshy, thick and full; upper lips, seen from the front, form an inverted “V” at their meeting point. The lower lateral profile of the muzzle is shaped by the upper lips; their lowest part is the corner of the lips, with visible mucous membranes, situated on the vertical from the external angle of the eye. Jaws: powerful with strong jaw bones and dental arches joining perfectly. Lower jaw must be well developed in its width. Teeth: white, well developed, regularly aligned and complete in number. Scissor bite, i.e. upper incisors closely overlapping the lower ones in close contact, set straight to the jaw, or pincer bite, i.e. upper incisors meet edge to edge with the lower incisors. Eyes: set on an equal frontal level, well apart one from the other; rather round, slightly deep set. Compared with the coat colour, the colour of the iris is darker. The eye may nevertheless be lighter in coats of diluted shades. Ears: small in relation to the size of the dog, of triangular shape, set above the zygomatic arch, they are flat and close to the cheeks. When they are cropped, they have the form of an almost equilateral angle. Neck: Profile: the upper profile is slightly convex. Length: rather short, measures about 2, 8/10 of the height of the withers. Shape: conical trunk shaped, well muscled. At mid-length the perimeter is equal to about 8/10 of the height at the withers. Skin: lower edge of the neck is well endowed with loose skin which forms a double dewlap well separated, but not exaggerated; starts at level of the lower jaw and does not go beyond middle of the neck. Forequarters: On the whole, the forequarters, from the ground to the point of the elbow, seen in profile and from the front, are vertical with a strong bone structure in proportion with the size of the dog. Shoulders: their length measures about 3/10 of the height at the withers with an obliqueness of 50°-60° on the horizontal. The muscles are well developed, long and well defined. The angle of the scapulo-humeral articulation is of 105°-115°. Arm: measures about 30% of the height at the withers. Its obliqueness is of 55°-60° furnished with significant musculature. Elbows: covered with abundant loose skin, they are not too close to the body. Forearms: its length is almost the same as that of the arm. Placed in perfect vertical position, of a strong bone structure, with lean and well developed muscles. Pastern Joint: broad, lean and without nodosity, continues the vertical line of the forearm. Pastern: flat, continues the vertical line of the forearm. Its inclination on the horizontal towards the front is of about 70° to 75°. Its length is equal to about 1/6 of the length of the limb from the ground up to the elbow. Forefeet: of round shape, large, toes well arched and well-knit. The pads are lean, hard and well pigmented. The nails are strong, curved and of a dark colour. 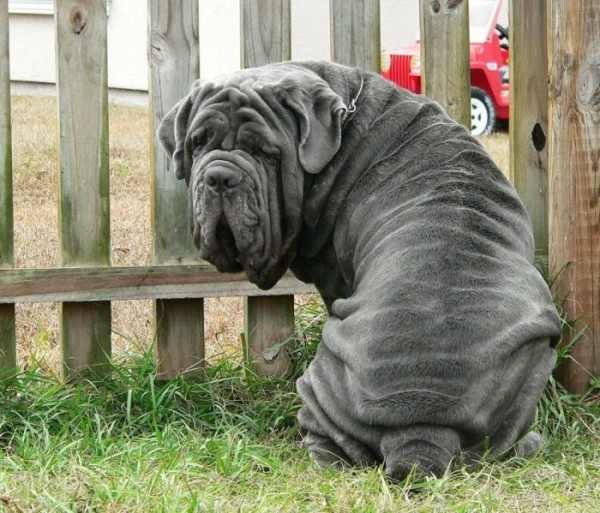 Neapolitan Mastiff Body: The length of the body exceeds by 10% the height at the withers. Topline: top line of the back is straight; withers are wide, long and not very prominent. Back: broad and of a length about 1/3 of the height at the withers. The lumbar region must be harmoniously united with the back and muscles well developed in width. The ribcage ample, with long and well sprung ribs. The circumference of the thorax is about 1/4 more than the height at the withers. Rump: wide, strong and well muscled. Its obliqueness compared with the measured horizontal on that of the hip bone (coxal) is about 30°. Its length is equal to 3/10 of the height at the withers. The hip bones are prominent to the extent of reaching the top lumbar line. Chest: broad and wide with well developed chest muscles. Its width is in direct relation with that of the ribcage and reaches the 40-45% of the height at the withers. The tip of the sternum is situated at the level of the scarpular-humeral joint. Hindquarters: On the whole they must be powerful and sturdy, in proportion with the size of the dog and capable of the required propulsion in movement. Upper Thigh: in length measuring 1/3 of the height at the withers and its obliqueness on the horizontal is about 60°. It is broad with thick, prominent but clearly distinct muscles. The thigh bone and the hip bone (femur and coxal) form an angle of 90°. Lower Thigh: length slightly inferior to that of the thigh and of an obliqueness of 50°-55°, with strong bone structure and well visible musculature. Stifle: the femoral-tibial (hip bone-shin bone) angle is about 110°-115°. Hock Joint: very long in relation to the length of the leg, its length is about 2, 5/10 of the height at the withers. The tibial-tarsal articulation forms an angle of 140°-145°. Hock: strong and lean, its shape almost cylindrical, perfectly straight and parallel, its length is about 1⁄4 of the height at the withers; eventual dewclaws may he removed. Hindfeet: smaller than the forefeet, round with well-knit toes. Pads dry, hard and pigmented. Nails strong, curved and of dark colour. Tail: Broad and thick at its root; strong, tapering slightly towards the tip. In length it reaches the articulation of the hock, but usually is docked at about 2/3 of its length. At rest is carried hanging and curved in sabre fashion, in action lifted horizontally or slightly higher than the top line. 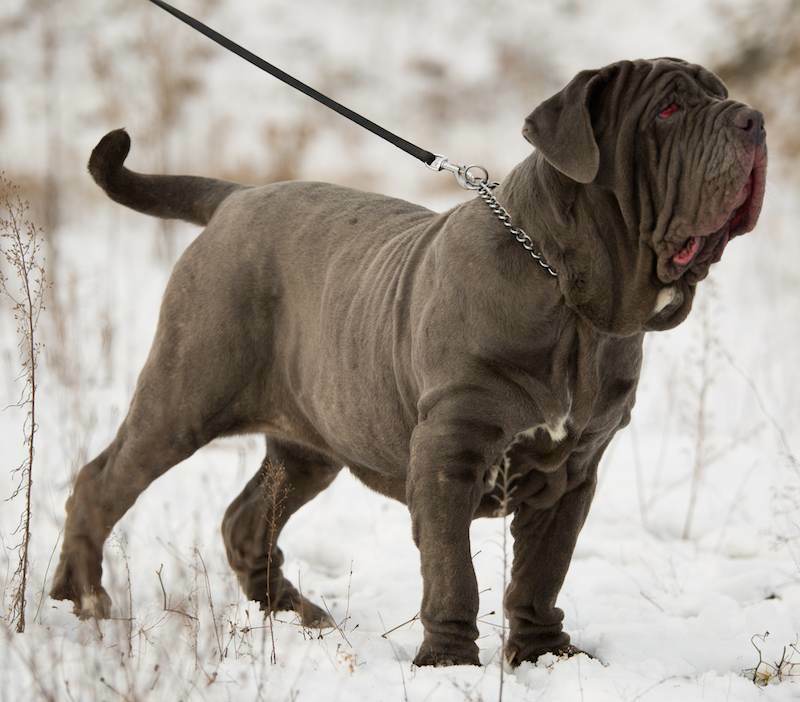 Neapolitan Mastiff Gait: This constitutes a typical characteristic of the Neapolitan Mastiff breed. At the walk, the gait is of feline type of lion steps, is slow and resembles that of a bear. The trot is distinguished by a strong thrust of the hindquarters and a good extension of the forequarters. 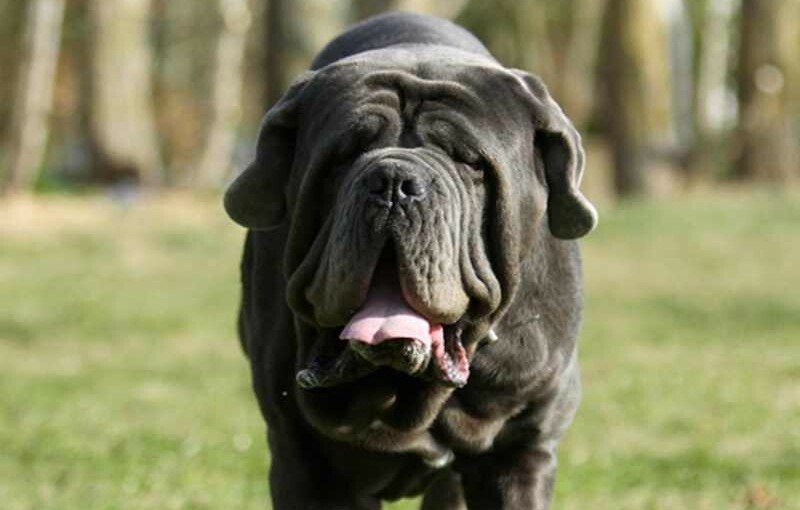 The Neapolitan Mastiff dog rarely gallops; usual gaits: walk and trot – Pacing is tolerated. 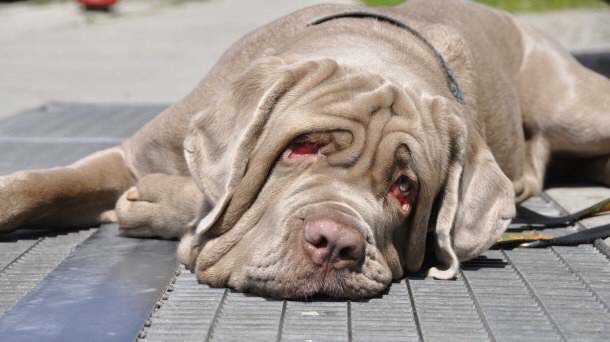 Neapolitan Mastiff Faults: Any departure from the foregoing points constitutes a fault which must be penalized in proportion to its degree. Serious Faults: Pronounced undershot mouth, gay tail (trumpet tail), sizes bigger or smaller than the limits allowed. Disqualifications: Overshot mouth. Accentuated convergence or divergence of the facial-cranial axes. Topline of muzzle concave or convex or very aquiline (Roman nose). Total depigmentation of nose. Wall eye. Total depigmentation of both rims of eyelids. Cross eyed. Absence of wrinkles, folds and dewlap. Absence of tail whether congenital or artificial. Extensive white patches; white markings on the head.